the patter of little feet and squeals of delight are only a happy memory. we had venison, potatoes and rhubarb pie. but if they didn't, they should have. It's our favorite. There's a belated Thanksgiving feast going on in the old dogwood tree outside our window. the bright red heart on the back of his neck matching the berries he came to eat. 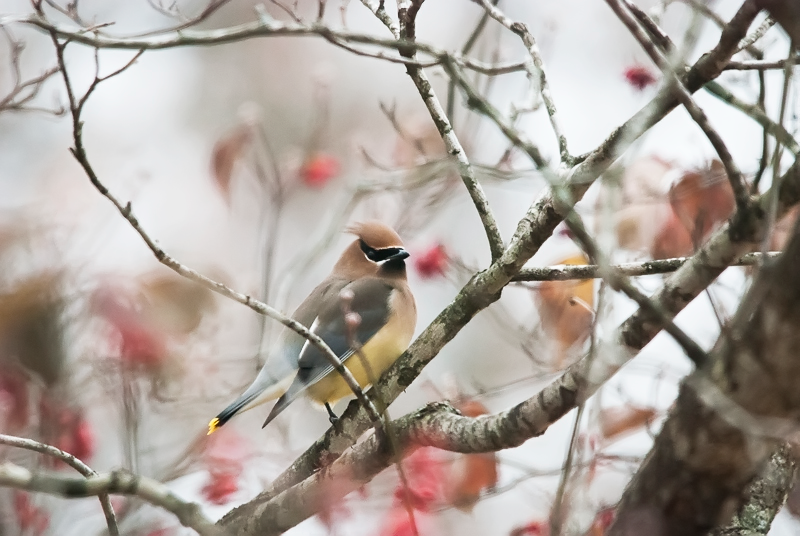 Cedar waxwings arrived in small groups, the tips of their tails freshly dipped in red and yellow wax. This celebration doesn't happen every year. 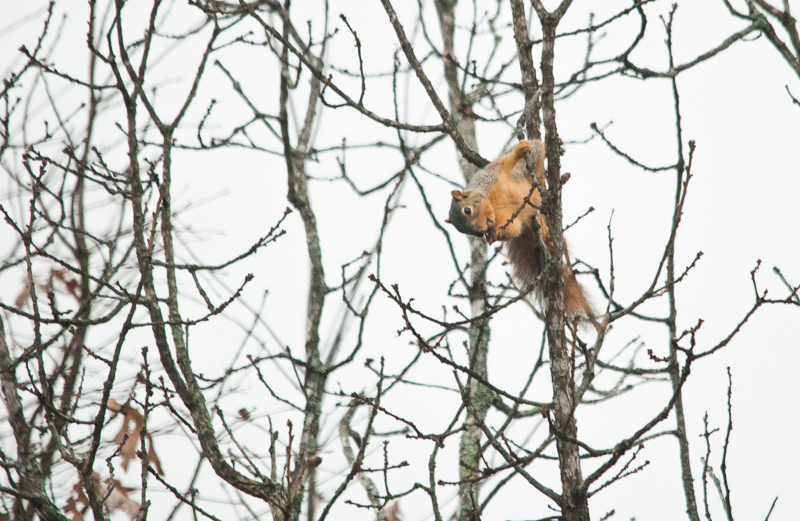 Often, the squirrels strip the berries before the birds consider them ripe enough to eat. and the squirrels are far too occupied with their favorite nuts to dine on dogwood berries. When the biggest bird on the block, the pileated woodpecker, dropped by, the other birds scattered. He didn't stay long, but picked up his carry out and flew away. Just one more bite of those sweet morsels and the bluebird flew away, too. I expect they'll all be back; there's plenty of berries left on the tree. When opportunity knocks, you'd better open your beak. 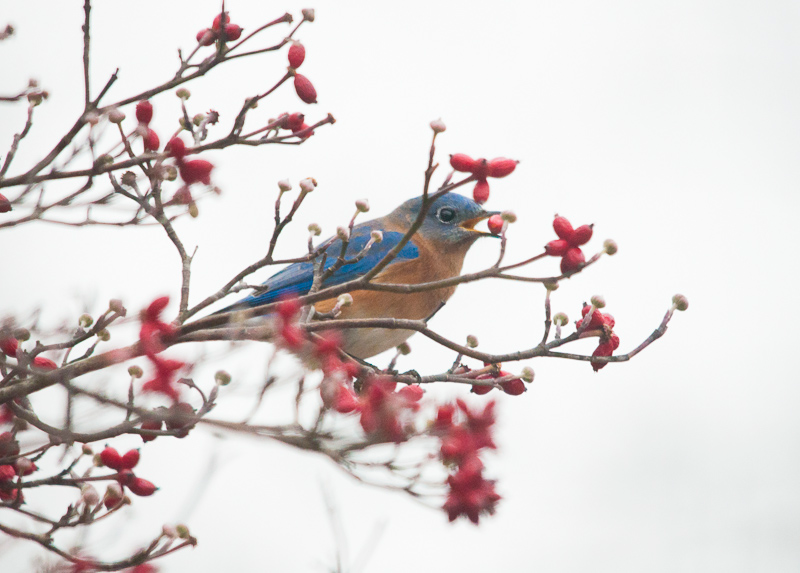 What a beautiful celebration going on in the dogwood tree! Lovely shots. Terrific photos and such a colorful sight. Blessed. Every. Time. I visit! Grace and peace. I'm with Kelly -- this blog is yet another masterpiece. Perfect. I never see cedar waxwings or flickers (too far from the woods, I think) so this was a real treat for me. And that big boy -- my guy never sits still long enough for me to grab a camera, much less get a shot. Love this in every way! Gorgeous photos! 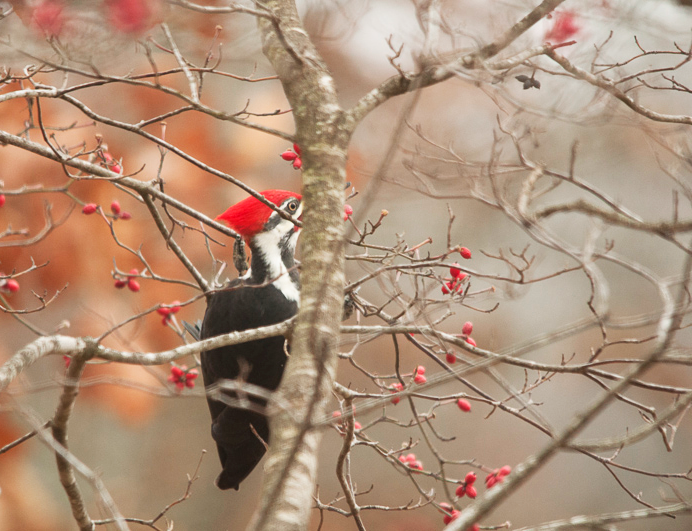 I'd love to photograph a Pileated Woodpecker! Great to see all these special birds on nice positions in the tre. Wonderful!! 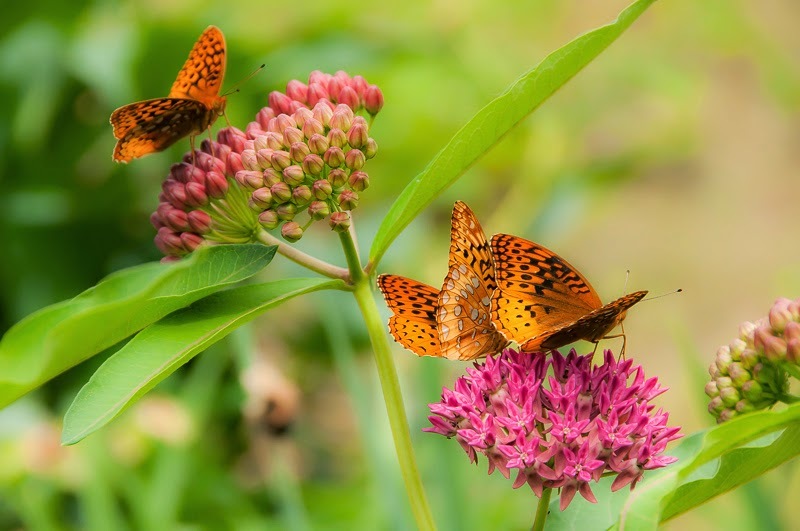 Gorgeous images! The birds and the berries are all beautiful. These are absolutely stunning images, Connie. fantastic images Connie. I love the flicker image, and the cedar waxwing is a close second. Oh such stunning images of the birds that visit you!! Hope your holiday season is filled with peace and joy! Beautiful shots with the birds and the berries. They look like Christmas birds. What a lovely variety of visitors you have! Beautiful photos. your home wears! such beauty. Connie, beautiful birds and wonderful images. I love the the First Flicker shot and the Waxwings.. Have a happy day! All your photos on this post are wonderfuf. Can't pick one! You have some amazing wildlife... many thanks for sharing your images. A great capture, the woodpecker is fantastic. Wow, I'm very jealous of the birds that you manage to see. All great pictures. Wow...I am in awe! These photos are stupendous. 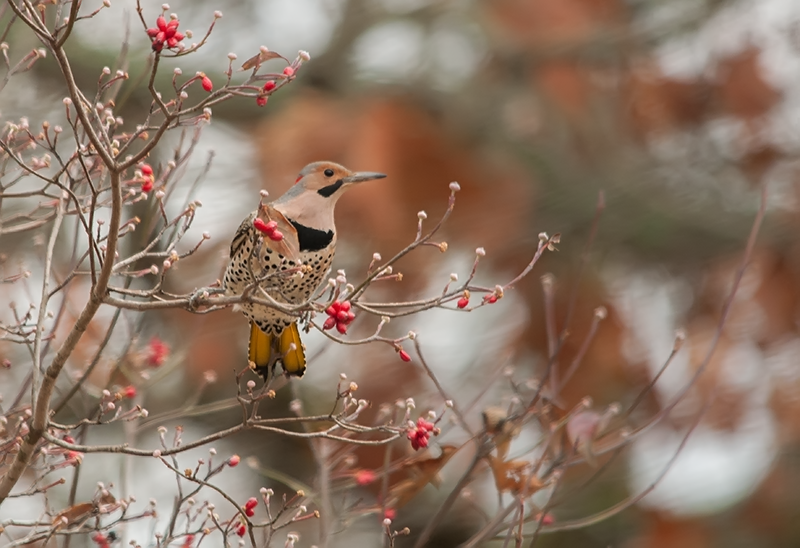 Gorgeous birds on the red berry branches! 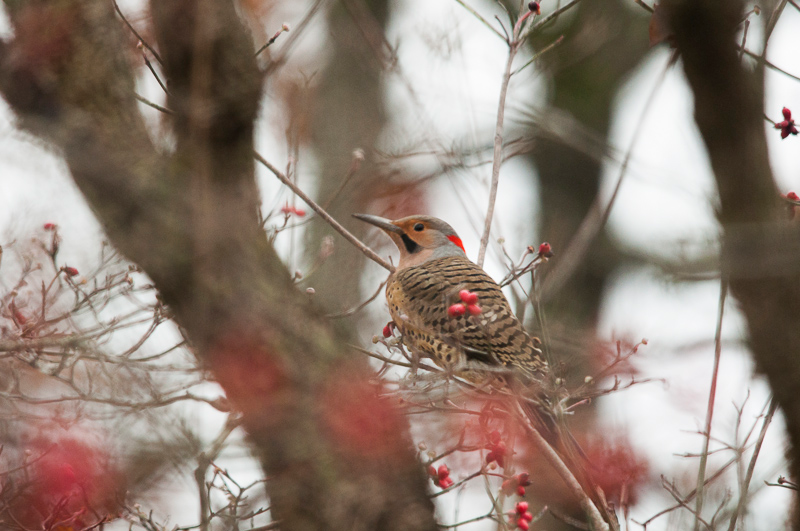 The flicker is great and so is the waxwing. All are wonderful shots! What a wonderful group of birds - thanksgiving indeed!